It’s a Two-fer Tuesday – A Pair of Parafaith Wars! Kendall Art Direction: I said I want him studly, you can see his 12-pack through the form-fitting metal space suit! … Well, why else do you think it’s called form-fitting?! You know what? 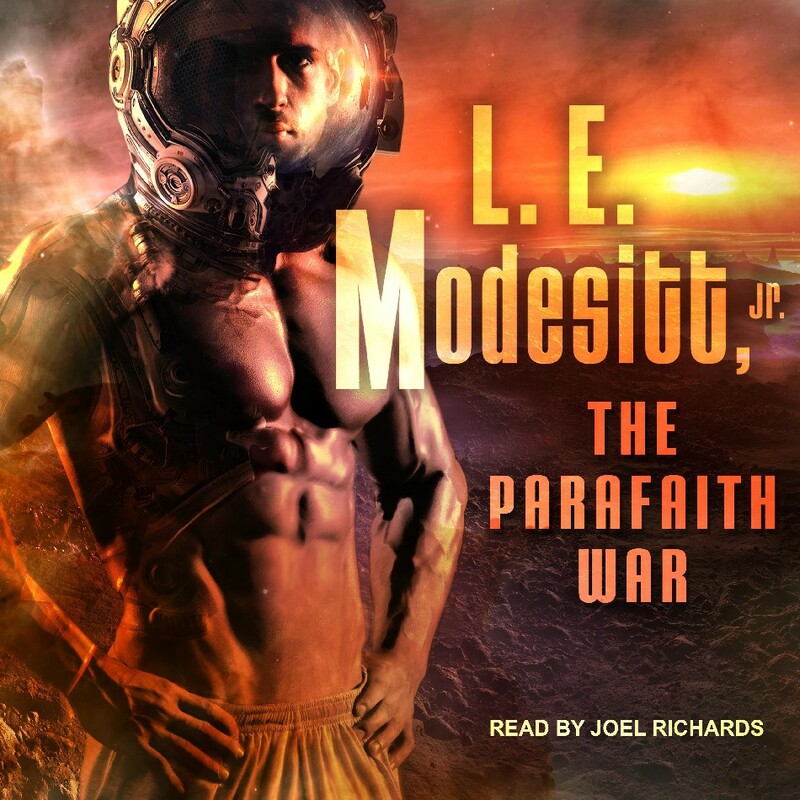 For the audiobook, just ditch the spacesuit; just show us the 6-pack. … Yes, I said 6-pack; we can’t afford that 12-pack – it’s just an audiobook! 1: Away with you and your Freudian psychology! Sometimes a big, long, stiff, powerful gun is just a big, long stiff, powerful gun! 2: How catalogue underwear models look in the future. 1. That’s how I felt when I rented a gas powered pressure washer this past weekend. 2. That’s how I felt after I finished the pressure washing. 1. There better be at least three chapters of strong technical detail explaining WTF I’m looking at. 2. Now that I’ve stripped off my spacesuit, how do I keep my elastic pants up? Help. I got my head stuck in a goldfish bowl. How do you train to get a body like contestant #2? That split-level effect, ripped to the end of the rib-cage, dadbod-in-drawstrings lower down, must be hard to maintain. @Tat Wood—Must be some kind of special cross-training. All I know is, that sort of body is a requirement to pose as a life model at the Unknown Artist’s Institute. 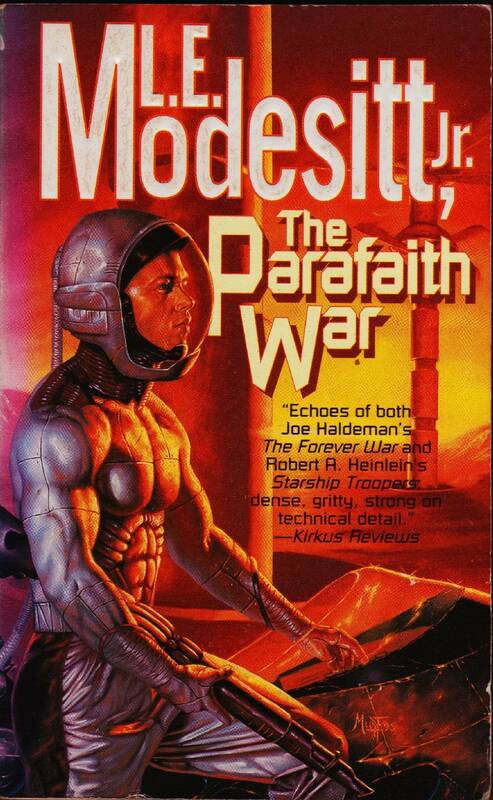 I can only assume there must be something akin to this ridiculous spacesuit in the actual book, since it’s appeared on two different covers. That said, not only does it look stupid, there’s something seriously wrong with our hero’s torso on the lower cover. It could be the suit, but given how tight it is, I’m very confused about what’s going on with those abdominal muscles, or lack thereof. There are many denominations in the Parafaith church. Parachutists believe they are descended from heaven. Paralegals believe in the word and the law. Paramecium believe they were placed on Earth to rule over the algae. @THX – He’s definitely not a Two-pac. There is some space struggle here between a race of theocrats called the “revs” and some science-believing race called the “eco-techs” and also some race called the “Fahrkans”. Cant put my finger on it but there are some deep metaphors going on here. I wonder if the Fahrkans all wear bow ties? @Bibliomancer: that must be why I see the sulphrous landscape and the bloke posing around in a space-helmet and the bottom of a shell-suit and think ‘Fahrkan Hell’. I misread the title as “The Parfait War”. I thought it was about a fight in an ice cream shoppe. The Paraffin War? No wonder he’s hairless. Ouch! LOL @ all the comments; glad you liked what I found. @Alice: Heh, you don’t get those ab-like things eating/working at an ice cream shoppe. @Bibliomancer—Not responsible! Farkhan lock it! I absolutely do not understand this guy’s torso in either photo. Or his skin vs. clingy space suit. Or navel. Or, really, anything. Mr. Plastic. It was so confusing I didn’t even notice the font abuse for a while.